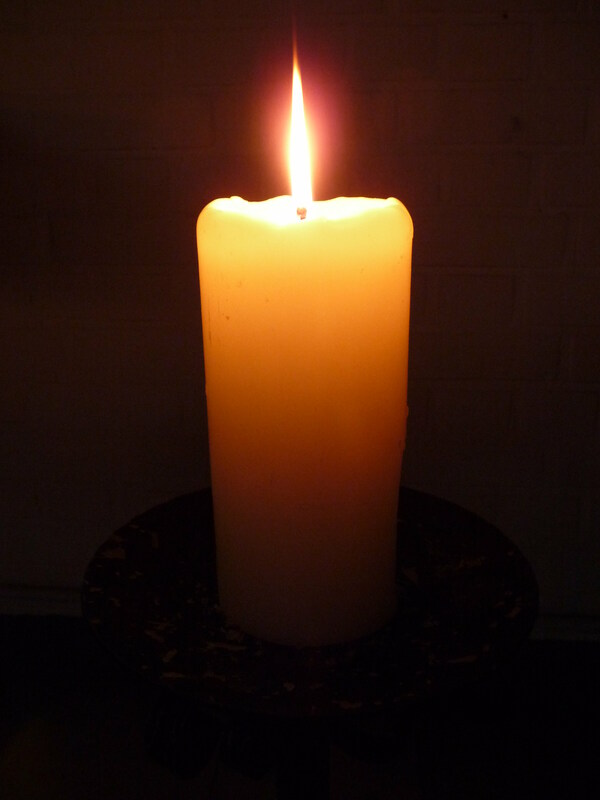 I know this is cheesy, but today I light a virtual candle in memory of my healthy knee. One year ago today was my fateful fall where I tore my ACL, MCL and meniscus. I think back on that time, remembering how trying it was having my mobility taken away from me, and what a long road the recovery has been, and continues to be. Overall, I am thankful. I am thankful I had great health insurance. I am thankful that I have one year of recovery behind me, and hopeful that I won’t have to endure something like that again. We have finally received snow here. While my husband is up enjoying the fresh powder, I am patiently resisting the urge to ski, knowing my knee just isn’t ready for powder yet. In the meantime, I’m happy to be mobile, able to keep up with my kids, able to participate in outings and family dance night, and able to work up a good sweat at the gym. Having a significant injury changes you. Hopefully in this past year, my children have witnessed bravery in the face of challenges, and I am a better person for the challenges that I have overcome. Yesterday as I was leaving the gym, the second I went outside I could smell smoke. Sh!t. Was my first thought. Reno hasn’t had any significant preciptation for several months. We had a horrible fire two months ago when a storm was blowing in and we had high winds. Yesterday, the fates aligned again with a storm blowing in, high winds, and a fire. I came back to my office to look up online where the fire was, and it was in Washoe Valley, just south of where we live. I wasn’t too worried until I got an update a few hours later saying that Callahan, a neighborhood one road up the hill from us, was being evacuated. I decided to go work from home at 3pm, as I wanted to be close to the kids if our neighborhood was evacuated. Turns out that was a very smart move. At about 4:30, I decided perhaps I should once again (as I did two months ago when the last fire hit) gather up some of our important paperwork. I went up to the office, and happened to look out the front window. I saw two of my neighbors gathered talking to a stranger. It didn’t take me long to figure out they were talking to a firefighter. I ran down the stairs and out of my house to find my next door neighbor, who does after care for my daughter was packing up and about to drive away. I quickly got my daughter from them, and as I was walking to get my son, the firefighter came up to me and said the area was being evacuated. She looked into our garage and asked if we were taking our dog with us. I said we were (mentally anguishing the stress on our 16 year old lab), and she tied a blue ribbon on our door, marking that we were evacuating. That was when it started to feel REAL. About that time, I turned and saw the flames coming down the hill towards our neighborhood. People often talk about what they would take in the event of a fire, and I can just say after packing up one suitcase for all 3 of us, our 90 pound dog and a pack and play, there really wasn’t much room in the car for anything big. I grabbed an empty box and filled it with photo albums, baby books, birth certificates and passports. I brought one change of clothes for each person, and the favorite loveys for each kid. I threw it all in the car, and started to back out of the driveway. There were so many people evacuating at the same time that I had to wait a few minutes before I could back out of our driveway, and then the main street in/out of our neighborhood was jam packed with people evacuating and emergency responders and news crews driving in. I drove straight to my brother’s house, and this is what the hill by my house looked like from his neighborhood. We turned on the news at my brother’s house, and the news announced that flames had reached the high school by our house. That high school is really CLOSE to our house. We walk there all the time. About this time was when I realized I was shaking. My phone was ringing and buzzing with texts as people offered me places to stay. The one person I wasn’t hearing from was my husband, who had left his cell phone at home, and whose car wasn’t at his office when I drove by on my way to my brother’s house. The kids and I ate dinner there, and I kept calling his office, only to get his voicemail. I knew in my gut that he was OK, but couldn’t imagine why on earth he hadn’t tried to get ahold of me. I finally got a call at 7pm (two hours after being evacuated) from a strange cell phone. He had been in South Lake Tahoe (in a snow storm) all day, and didn’t realize there was a massive fire until he drove into Carson City. He stopped at a fast food restaurant and asked the cashier if he could use their phone to call me. The road in between Carson City and Reno was shut down, so he had to seek refuge at a friends’ house in that area. I ended up going to my friend Annie’s house, as she had enough bedrooms to accommodate the kids and I, as well as our poor old dog Shadow. I was rather afraid all this excitement might be too much for old Shadow, but he hung in there through two changes in venue last night. I didn’t sleep much. By the time I went to bed, I was pretty sure our house would be OK, but it was still disconcerting. This morning, our area was considered still evacuated, but I called a neighbor to find out that they were home and people were returning to there houses throughout the neighborhood. No homes in our neighborhood burned, but over 20 did in the neighboring valley. Reno has been struck by so many tragedies in the last year. Can we just get some significant preciptation and a bit of a break, starting NOW? The past two weekends, we have been going skiing as a family of four. That is really special to me, considering my knee injury last year, and the fact that it is Little Man’s first ski season. 1. We suggest skiing, and he gets all excited, saying, “I want to ski!” He is happy the entire ride to the ski area. 2. We get there, and once we get the jacket, helmet, goggles and gloves on him, he melts down. This is about the time I send JB to the slopes with Little Miss, and I get to deal with the screaming toddler. 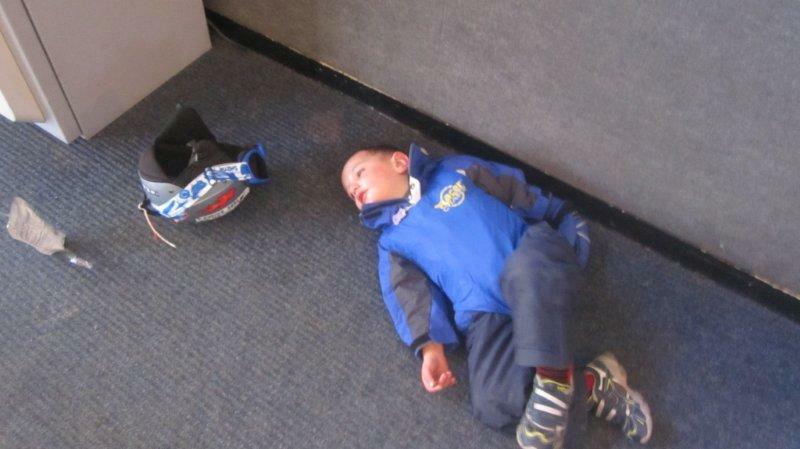 People in ski lodges think a kid throwing a tantrum in ski gear is REALLY funny. I am pretty much over it. I tend to grab a camera, take a few pics for future blackmail purposes, and then I sit down about 10 feet away from him until he snaps out of it. Right after this picture was taken, I ran into my former boss. 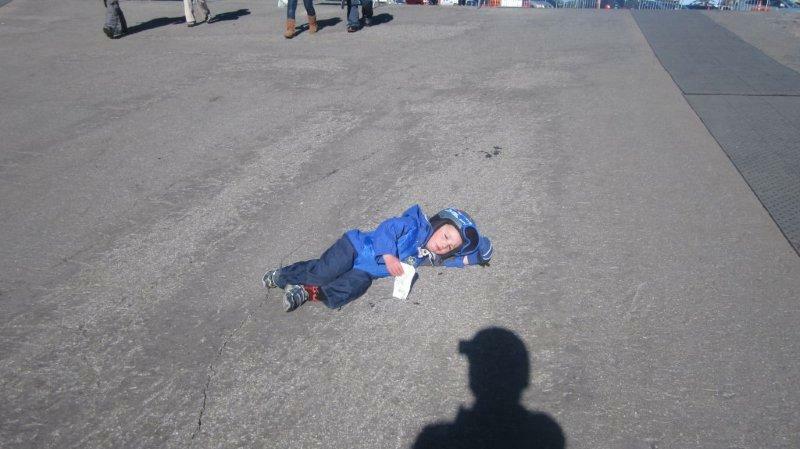 It is a bit embarrassing to have your kid losing his s*#t on the floor. So then, we head to the chairlift looking for the dragons. Whatever works, I’ll do it. Of course the snow conditions here have been hideous — all man made at this point. They’ve been making snow during the day, and I’m pretty sure he thinks the snow guns are the dragons. 4. After he snaps out of his tantrum, things are fine. He likes to ride the chairlift, and makes hilarious noises we’ve dubbed his ski noises, which usually include squeaks and squawks. He’s a little trooper after he gets over his initial issues. Last night, he told us that he wanted to take his basketball skiing, but that he’d hold on to it really tight so that the dragons wouldn’t get it. JB said he’s going to take Little Man skiing on Sunday while I’m in Disneyland with our daughter. I’m curious to see if he’ll pull this stuff with Daddy, and if he does, what Daddy’s reaction will be to a half hour tantrum. I’m taking Little Miss to Disneyland one week from tomorrow. She has NO idea. Sometime in the next week, I have to figure out a way to let her in on this early birthday present, and my main goal is to COMPLETELY BLOW HER MIND. I’ve been trying to bait her for this experience. “If there was one place in the world you’d like to go, where would it be?” I asked. OK, well that is a good answer, and I’m not going to debate that. I’ve also told her that she’s not having a big party this year because she is getting a SUPER HUGE PRESENT. It’s just going to be us two traveling. JB isn’t interested in Disneyland, and I don’t want to take a 2 year old there… It would be so much harder to deal with nap times and tantrums, and height limits with only one adult to manage the two kids. Little Miss is tall enough for almost all of the rides, and we’re going to hit the big kid rides one after another. I’m pretty sure I’m going to tell her about an hour before we need to leave the house. That way, I announce it, we pack her bags, and zoom, off to the airport! I’ll definitely videotape the reveal, as I had no idea, but there are countless videos on YouTube of parents surprising their kids with Disney trips. Who knew?! I went to DisneyWorld for my college Spring Break when I was a senior. I remember saying after that trip that I didn’t see many happy kids there, and that I didn’t plan to take my kids to Disney resorts. But now that I’m a Mom, and I know how much this would blow her mind, and I am pretty sure (fingers crossed) that she is mature enough to handle 2 days at DisneyLand without a meltdown, I’ve changed my mind. For Little Man’s sake, let’s hope this goes well, and that I don’t swear off future trips to the happiest place on earth. We went up to Mt. Rose three times over the holiday break to get the kids skiing. The first two times, I simply helped shuttle kids and equipment to JB, who was working patiently with both of them. Mt. Rose where where I injured myself, and from where I stood, I could see the scene of the accident, where I fell within sight of the lodge and the lower mountain, and had to ride a snowmobile down to the ski patrol. Yesterday, I finally got up the courage to try skiing again. The doctor told me I could ski 9 months after surgery, and to start slow. Eleven months, three weeks after my initial injury, and nine months, two days after my surgery, I made my return to skis. I did three beginner runs, and got to ski with the hubby and both of my kids. I still have a lot of work to do to get back to “normal”, if that will be possible, but the first major hurdle in conquering my fears has been cleared.